The Ultimate Module Challenge brings everything you love in an inflatable attraction together in one brilliant design! 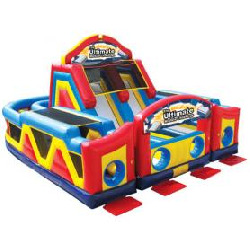 The 3 pieces include (1) double lane slide with climb challenge steps and tunnel exits and (2) L-shaped obstacle alleys that include a variety of pop-up, pop-out and log features. Each piece can stand alone or be combined to create literally dozens of obstacle designs! Dimensions: 28' L x 35' W x 20' H. Please allow 32'L x 39'W space for adequate clearance.